← September 11: Where were you? 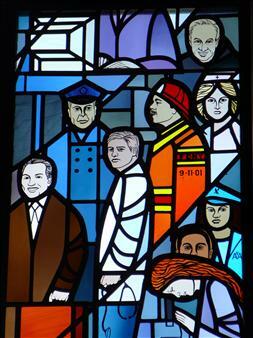 9/11 memorial stained glass window. Photo added to Thomas Pecorelli's Guest Book by artist Anna Truckey. September 11, 2001 was a beautiful, sunny, late-summer day in northern Virginia. It was Tuesday morning, and I was busy getting ready for work when my husband called up the stairs and told me there was something on TV that I should come down and see. I arrived to see Katie Couric trying to describe what had happened to the first tower, when just at that instant the second tower got hit. I knew at that moment it wasn’t just an awful accident, but clearly a deliberate act. Suddenly, more than anything, I wanted to get to work and be around other people, doing familiar, predictable, routine things, anything to distract myself from what I couldn’t understand. I drove to my job as a children’s librarian at a public library in Fairfax County. The local rock station on the car radio was playing a direct feed from ABC news, where Peter Jennings was trying to bring order from chaos. I remember sitting at a traffic light watching an airplane fly over my head toward National Airport when a guy called in to the radio station and reported that he was sitting in traffic in front of the Pentagon and had just seen an airplane fly into it. That was less than two miles from where I sat. I watched the airplane overhead with suspicion now, wondering where it was heading, and was it being controlled by someone meaning to use it as a weapon. I’m not religious, but I remember praying fervently that the people on it were going to be OK. It must have been one of the last planes to land at National that day; they shut the airport down for weeks after that. My family and I lived east of Dulles and west of National so we were among those living in a “no fly zone.” You don’t notice the sounds of air traffic until it isn’t there. For weeks, nothing but eerie quiet, except in the middle of the night, when military helicopters and jets patrolled overhead. At work on 9/11 we had a television on at the circulation desk and everyone, staff and patrons alike, watched somberly. What I remember most vividly was the surreal sight of papers swirling and drifting in the clear, sunny New York morning air from the broken windows of the twin towers. How the common detritus on desks was suddenly flying everywhere. How many of those papers were drawings done by someones beloved child, whom they’d never lay eyes on again? How many were missives from a boss, seemingly high priority one minute and tragically meaningless the next? How the ordinary became extraordinary was so heartbreaking. My elementary school-age kids and their schoolmates were told something bad had happened, that the school administrators couldn’t explain, but that they were being dismissed for the day at 10 a.m. Schools were canceled the next day as well. The aftermath of the Pentagon attack permeated the atmosphere of my children’s school. In the coming days they were required to bring two days worth of clothing, food and water to school in case of a rumored dirty bomb attack. Their teachers were required to bring duct tape and plastic wrap to seal their classroom windows and doors. We parents were informed that in the event of another attack we would not be allowed to retrieve our children from school until the authorities deemed it safe to do so. The horrors in New York and Pennsylvania were a world away for my kids but, as little as they understood, the fear in the D.C. region was very real. My mother-in-law lived in a high-rise across I-395 from the Pentagon at the time. The Saturday after the attacks she took my 10-year-old son to see the damage. I worried it would be too traumatic for him but he assured me that he knew it was an important and tragic event and that he would always remember seeing it first hand. I can only imagine what the people in those buildings and on those airplanes were experiencing that day. When I think of specific people who lost their lives I always remember three 11-year-old children on American Airlines Flight 77. Asia Cottom, Rodney Dickens and Bernard Brown were flying with three teachers and two National Geographic staffers to L.A. to take part in a National Geographic-sponsored program. It must have been a once-in-a-lifetime opportunity and I assume because of their young age they’d had little chance to travel so far away from home before. How excited they must have been. How nervous and excited their parents must have been for them. How difficult it must have been for their parents to let them go, even for a week. I don’t want to imagine what it’s like to let go forever. This September 11 I will remember them all. I will remember that they were ordinary people, doing ordinary things, the same things you and I do every day, yet they were all extraordinarily loved by someone. My heart goes out to all those who loved them so much. I've been with Legacy since November of 2006. I have two teenagers at home, and in my free time I collect fabric for quilting, read, listen to the waves on Lake Michigan and look after my 91 year old dad.